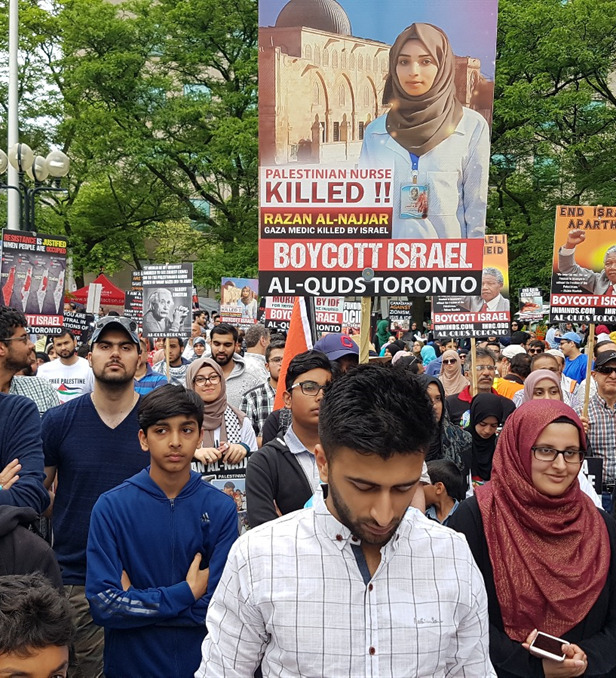 Over 2,500 Jews, Christians, Muslims and people from all walks of lives in Toronto joined millions of protestors in over 800 cities to condemn the israeli war crimes against the indigenous Palestinian population. The protestors expressed their solidarity with the 7.2 million refugees who have been forced out of their homes by the Zionist extremist settlers, who believe that they have a religious right to the land. The attendees also expressed their dismay at the incarceration of over 800,000 and the massacre of over 9,000 Palestinians including over 2,000 children. Speakers at the rally, which included Jewish human rights activists, strongly condemned the war crimes committed by the israeli army especially in the past two months in Gaza. Many of the attendees wore lab coats to express solidarity with Razan Al-Najjar, a 21 year old Palestinian nurse, murdered by the israeli army snipers for the crime of trying to help an injured protestor. A number of women also carried coffins of children to give a voice to the anguish of the mothers of the Palestinian children including an 8 month old baby killed by tear gas poisoning last month and a 15 year old boy shot dead by Israeli snipers on Friday. The attempts by JDL and B’nai Brith to stop the Al Quds rally failed miserably again this year. 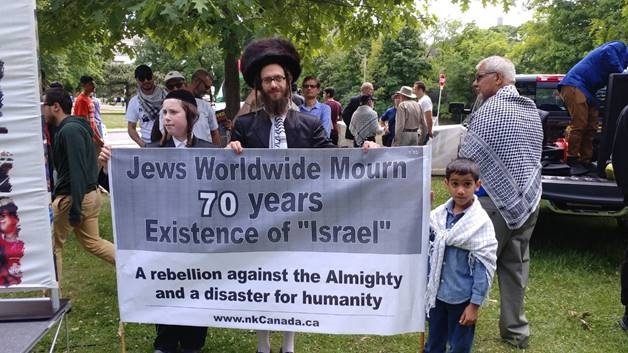 The Jews attending the rally also strongly condemned the unsuccessful efforts by these organizations to label condemnation of israeli war crimes as anti-Semitism and vowed to never let the racist ideology of Zionism represent the beautiful faith of Judaism. The speakers at the rally also issued a strong condemnation of the derogatory sermon by the Chief Rabbi of Israel in March 2018 in which he referred to black people as ‘monkeys’ and reinforced Zionist racial supremacist ideology of defining the purpose of existence of non-Jews as servants of Jews.